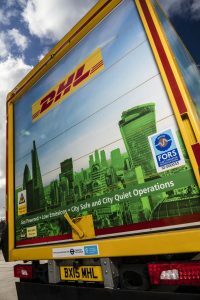 FORS, the Fleet Operator Recognition Scheme, has launched a dedicated FORS Vehicle Graphics Service (FORS VGS) to provide members with low-cost, hassle-free access to its complete range of high quality FORS ID graphics and warning signage. Every FORS ID purchased will qualify for a free warning signage graphic. FORS has appointed vehicle graphics specialist, RGVA, as its exclusive supplier of FORS graphics and warning signage. RGVA also becomes the scheme’s latest FORS Affinity Partner – one of a select group of appointed companies offering discounted, FORS-branded products and services specifically for FORS members. Recognising that a number of members have encountered problems in producing their own FORS ID graphics, either through IT-formatting issues or difficulties in procuring a local printing service, FORS VGS is now in place to streamline the whole process – providing low-cost, standardised signage products for all FORS members. FORS VGS allows FORS members to order high-quality ‘3M Envision’ FORS ID graphics quickly and easily through the FORS website. Every FORS ID purchased will qualify for a free warning signage graphic, while orders for ten or more graphics will attract an additional 15% discount. FORS VGS graphics are produced with a three-year 3M Matched Component System Warranty. In line with the key FORS message of environmental protection, FORS VGS products are PVC-free and made using degradable vinyl which breaks down under landfill conditions without emitting toxic gases or other pollutants. For more information, please go to the FORS website. Click here to find out more about FORS.